Martha J. Joseph was a leader of the Greater Cleveland cultural community for more than a half century. In addition to ultimately serving as president of practically every arts organization with which she became involved, Joseph helped to create two new cultural enterprises that have nurtured the artistic impulse here and abroad: the Cleveland Arts Prize (see “Arts Prize History” in this site’s “About Us” section) and the Cleveland International Piano Competition. She provided dedicated and able leadership to both of these endeavors long past their growing years, serving as chairperson of the Cleveland Arts Prize, for example, for 30 straight years. Martha Joseph, who shared the spotlight with her husband and partner of 50 years, was such a figure. The recipient of the Chevalier de L’Ordre des Arts et Lettres from the French government (1984) for her work as co-founder of the Cleveland International Piano Competition, she also initiated the process that led to the founding in 1961 of the Cleveland Arts Prize. Educated at the Sorbonne and the University of Dijon, Joseph decided as a young girl growing up in Cleveland that music and the other arts must be at the center of her life and, indeed, that they would be the wellspring of meaning and joy that would energize her in all of her civic activities. Her father, Ralph Joseph (she and Frank were second cousins), was a fine pianist who sight-read piano arrangements of the music for the Cleveland Orchestra’s upcoming concerts every week while his daughter sat quietly listening. Her mother, Ray Hahn Joseph, chaired the Music and Arts Committee of the Women’s City Club, the precursor to the committee that would one day oversee the Cleveland Arts Prize. Martha would carry with her through life both her mother's fervent community spirit and her father's love of the piano. While raising three children, Martha Joseph found time to serve on the Women’s Committee of the Cleveland Orchestra, of which she was eventually to become president. She was also president of the Women’s City Club of Cleveland and the Women’s Committee of the Cleveland Institute of Music (CIM), helping plan the school’s move to its University Circle location. 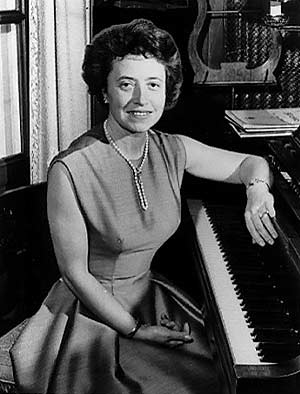 As president of CIM’s board of trustees (1965–70), she worked closely with the world-famous composer and pianist Victor Babin, then the Institute’s director, helping to launch a school-based opera company and the Encore School for Strings, a summer music program for gifted students that still flourishes. When Babin died suddenly in 1972, it was Joseph who skillfully guided the institute through a difficult interim period and recruited his successor, the eminent pianist Grant Johannesen. In 1975 she and Johannesen co-founded the Robert Casadesus International Piano Competition, named for the late French concert pianist, composer and teacher, whose collaborations with George Szell on the late Mozart piano concertos remain legendary. Eschewing the flashier repertory favored by most of the better-known piano competitions, the Casadesus would emphasize clarity of statement and a pianism of subtlety and nuance, the final round requiring a performance, with orchestra, of a Mozart concerto. Increasingly respected for its high standards and openness to unfamiliar and adventurous modern repertory, this biannual event (renamed the Cleveland International Piano Competition in 1994) draws 1,000 applications from as many as 50 countries. Gifted pianists from 20 or 30 nations are then invited to Cleveland to compete in a grueling 10-day display of keyboard virtuosity. A number of past winners, including Jean-Yves Thibaudet, Antonio Pompa-Baldi and Sergei Babayan, have gone on to become internationally recognized performers and teachers. From 1975 to 1991 Joseph served as vice president of the Casadesus Competition. When Johannesen left CIM in 1991, she succeeded him as the competition’s president. (Although there has traditionally been some overlap in leadership, the competition is a freestanding organization with its own board and staff.) In 1995, at the importuning of the institute, she became chairperson. In 1977, a decade after the Cleveland Arts Prize Committee insisted that Martha accept a Special Citation for Distinguished Service to the Arts, she was awarded an honorary doctorate from CIM. The following year she, husband Frank and son Bill were presented with the Ohio Arts Council’s statewide award for arts patronage, becoming the first Cleveland family ever to be so honored. The Art Prize's Special Citation was named in her honor in 2002.